This Aperture area calculator helps you compute the aperture area of a lens. Try the calculator right now or keep on reading to learn about the aperture diameter, f-number, and the aperture area equation. Aperture is a hole, or an opening, in an optical system through which the light enters. The larger the aperture, the more light can come. In the same time, the light is less collimated. Smaller aperture results in more collimated light entering at the cost of lower intensity. If you want to learn about different ways of measuring light intensity check the Lumen calculator. The aperture diameter is just the diameter of the opening. The other characteristics of an optical system, such as a lens, are the f-number and the focal length. The focal length is a distance over which the initially collimated light rays are brought to a focus. The larger the focal length, the more distant objects can be seen sharply. You can check the thin lens equation or Lens-maker equation calculators to check how to compute the focal length of a lens. n = f / D.
In commercially produced lenses we can usually set the f-number to some prescribed values like 1.4, 2, 2.8, 4, 5.6, .... They correspond to decreasing the aperture diameter by a factor √2. In turn, the aperture area decreases by a factor 2. A is the aperture area. For example, if we set the f-number to be 1.4 for a common lens of a focal length f = 70 mm, then the aperture diameter is D = 50 mm. 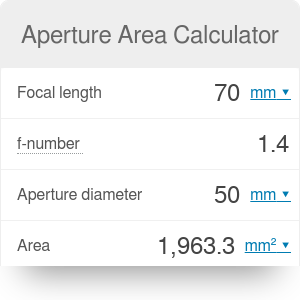 Using the aperture area calculator we find that the aperture area is A = 1963.3 mm². Aperture Area Calculator can be embedded on your website to enrich the content you wrote and make it easier for your visitors to understand your message.